Since, you know, there’s still actually two more episodes left, though how relevant those episodes will be is up to question. Way to shoot yourself in the foot with artificial episode counts Kyoani. I’m really starting to hate this increase in DVD only episodes, but I digress. 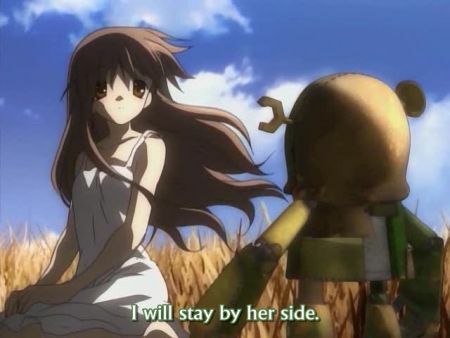 So how does Clannad end? Sadly not with Dangoes but the most last minute love confession in history. Yes, Tomoya confesses to Nagisa with one minute left on the clock. It’s like Kyoani remembered there was suppose to be a relationship in there somewhere. For me, love confessions are not the end of a relationship; often it is what happens afterwards that is the most interesting, and which sadly most anime tend to ignore. I love how love confessions in anime dictate that the characters are going to be married for life when they haven’t even dated yet, but again I digress. The best part of the ending was Nagisa’s play, and by play I mean the part where Akio comes in acting all manly. Nagisa does not pull off emo well, especially when the answer to her problem was so obvious. Everybody knows (good) parents care more about their kid’s dreams than their own. Just look at all the rabid soccer moms. 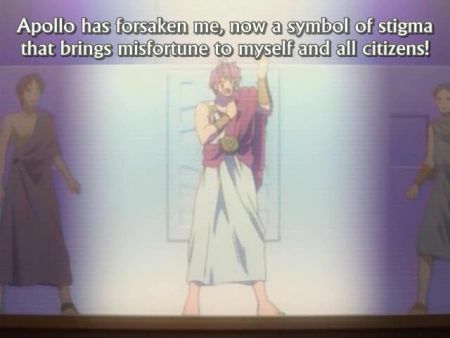 Nagisa’s whole emotional breakdown appears forced when held up to common sense, and fortunately Akio saves the audience, both fictional and real, from more crying Nagisa with his fiery words. More shows need hot blooded dads; they save everyone from needless melodrama. The most interesting things I noticed about Akio, however, was what play he was acting in in high school. From all the little evidence - mentioning of Thebes, the Sphinx’s riddle, Apollo, and the blood streaming down Akio’s face - I bet that’s Sophocles’ Oedipus Rex. A very interesting reference for Kyoani, since when looked at one way Oedipus Rex is all about the destruction of a family by lies and secrets. Similarly, Nagisa’s family, in her eyes, risks destruction from the the secrets of her parents. Fortunately familial love comes through to save the day and Nagisa doesn’t need to claw her eyes out. For Clannad as a whole, I’ll give it credit for doing a few things right. The comedy was often excellent, whether low-key and sarcastic or pure slapstick. A lot of this strength came from the strong cast, with a lot of the comedy also coming from Sunohara; best male sidekick ever. 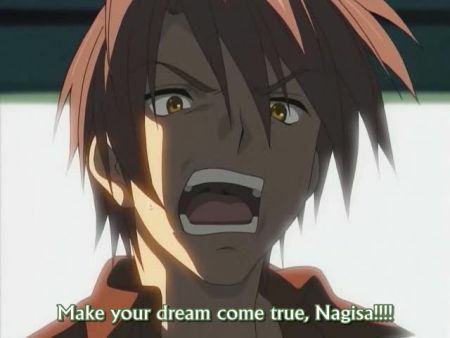 Most of the characters fortunately managed to grow and change as the series when on, particularly Nagisa and Tomoya. Nagisa’s change from a waifish outcast to an inspiring leader makes her character all that much more endearing; indeed, she’s my favorite of the cast. Tomoya’s shift in cynic attitude was also handled well, I just wish the show would of showed his complete change. 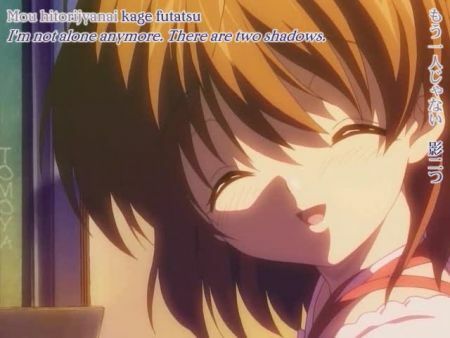 Which leads us to the main problem of Clannad: pacing. Even more so than AIR Clannad has terrible pacing. Between six to seven episodes were spent on Fuuko and Kotomi each, while Nagisa, Kyou, and Tomoyo probably got half that amount. I don’t care if Kyou and Tomoyo’s routes are incompatible with the larger plot, they still should of been worked in some way. Then there’s the girl with the robot, which was never really developed at all. I get the connection to the play, but that’s such a tenuous connection at best. If the girl was so important, shouldn’t she of shown up more instead of disappearing and reappearing every few episodes? I know from spoilers that the girl really is a part of the After story, which of course isn’t in the show. It’s like the whole show is working up to this dramatic story at the end that doesn’t happen. Many people are hoping Kyoani will animate the After story, but I’m not holding my breath for that. What other ero-adaption, aside from Da Capo, has ever gotten a sequel to cover unanimated material? In the end I have to rate Clannad has one of Kyoani’s lesser works. I’m not sure how it compares to AIR, but I definitely know Kanon was done better. 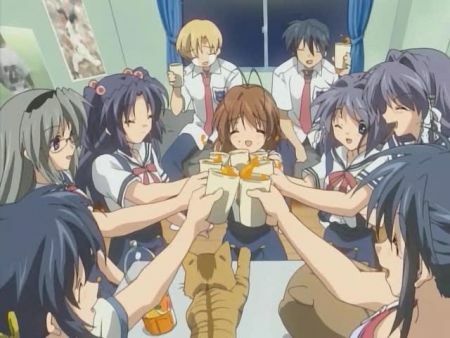 The characters and humor for Clannad are good, but when it comes to telling a good story the show just falls apart. Why can’t you stay dead? !